Monday, December 12th, 2005 | 1:24 pm	and filed in peff, Power Tools For Reason. For those who placed orders with Amazon.com, it looks like orders have started shipping. Again, I’m sorry for the delay, and I hope people will not be disappointed with the second edition of Power Tools for Reason. The amazon page does not provide all of the accurate information. Pictured here is the actual cover. The number of pages is 294-not including the index which brings the total to 312 pages). Please remember, that my book is NOT INTENDED FOR ABSOLUTE BEGINNERS! Commonly asked questions fielded my way are “what’s different from the previous edition?” and “is it worth it to pick up another copy?” The short answer is probably not. If you’ve managed to fully grasp the concepts in PTR-2.5, then programming the Combinator should be second nature to you by now. Most of the projects were merely updated to adopt the Combinator Modulation routings instead of using Control Voltages. For example, the ‘Screamin Filterbank’ project is now a combinator project rather than an overwhelming rack of devices in a song. Naturally there were a few modifications which use the MClass compressor and limiter. The only aspects which may benefit people who read PTR-2.5 are the new chapter on Mastering, and perhaps the rewritten Dynamics, Synthesizer and Sampler programming chapters. The chapter on Dynamics is revised to explain the principles of compressors better as well as examples on how to use the features of the MClass compressor and Maximizer. The COMP-01 is still a handy devices and a brief example is included to explain when to use it instead of MClass comp. The Synthesizer and Sampler chapters now include step-by-step projects which explain how to manipulate parameters to create different timbres from the basic walkthroughs of programming subtractive synthesis patches to FM and Phase Diff on the Subtractor, to creating lush stereo Malström patches. It’s a lot slower paced than the chapter in the first edition, and breaks down the different parameters and how they affect the resulting sound from the Subtractor and Malström. It’s not an exhaustive discussion, but the projects are pretty detailed. The same concept is applied to the Sampler Chapter as well, so that people who have very little experience with samplers can grasp the concepts behind creating a multi-sampled NN-XT patch. I spent the weekend adapting an excerpt from the book to be published on the Propellerhead Software Website as part of the “Discovering Reason” series. Like the previous article “Filter Up” (misspelled in the reference in the book), published with the release of the first edition, the new article is a bit different with another bonus project not printed in the book. Unlike the book that only provides the procedures for creating the project, the article will have Reason Song files with the completed examples. If you’re on broadband, please visit the PT-Reason site to see even more examples, and check out the credits for all of the people who contributed to the samples and material included on the CD-Rom. The desktop wallpapers created by my cousin, Miles, are really cool, and are available on the download section of PT-Reason.com. Oh, and if you’re in San Francisco, you can pick up a copy at Robotspeak! Great news. I headed straight over to Amazon & ordered my copy. i just got mine, and besides that i was expecting it in about four days time, but it came earlier, so thanks guys, great job, and by the way i recommend the book not just to computer artists but to any musician. Greetings from sunny South Africa …. Thanks for all Peff and good luck! I learned a lot from your 2.5 book, but the 3.0 book has really opened my eyes to the potential of the Combinator! Thanks for sharing your brilliant ideas! Have ordered my book now! Seeing forward to read it! Respect, Flandersh! Thanks for your work on this site and everything. 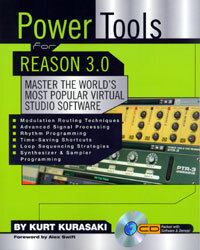 I really love Power Tools for Reason 3.0! The High Pass filter Combinator is ingenious! I’ve been using it a lot! how do you make hipass filter? I WANT THISSS!!! Your book is a real gem. It now sits alongside my copies of Mixing with your Mind, the Audio Engineers handbook & Mastering Audio. These are all my top shelf books written by legends of the industry. Even though it’s a very program specific book, I have no hesitation placing Powertools for Reason on my top shelf, it’s that thorough and that good. You certainly know your stuff.